I want to wear short shorts. OK, not super short shorts. But I want to wear shorts. I want to be happy. I want to be cool during the hot summer days. I want to wear nice cotton shorts. However, I’m not about to show my shin spots to the world. I did that once. My two nephews looked at my legs and asked, “How did you get so many owies?” Then they proceeded to show off their owies. My nephews are adorable. I would like a pair of these socks, please. Thank you. Back in my youth, I ran around the neighborhood in knee-high striped socks (or my Wonder Woman underoos). I loved them. I didn’t care the socks were for boys. I loved them. These socks are the perfect accessory to cover my shin spots until they get better. Comfy sports shorts and striped socks would be cute, right? Right? Just answer yes, please. In my mind, I’m totally pulling off the look. But I cannot find them anywhere. No, that’s a big fat lie. I found some striped socks at MC Sports, but I wasn’t about to pay $9 for ONE PAIR. No thank you. Every retail store I enter, I looked in ALL of the sock sections (women’s, men’s, boys, girls, and sports — remember my feet are small). 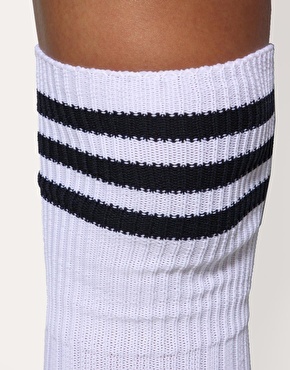 Nike and Adidas offer some sporty tube socks with stripes, which I will probably break down and buy if I don’t find the socks I want or give up out of pure frustration. But all five sections didn’t have any socks from my youth. Do companies not make these awesome socks anymore? That thought kind of saddens me. All of the stores have simple white tube socks that I don’t like. It’s not cute. It’s not flirty or fun. I want simple and cute. Simple white socks with simple stripes. I’m not 5 years old, which means I don’t want Hannah Montana or unicorns running over hot pink tube socks. I may have small feet, but I’m too mature for hot shaded colors and glitter. Really, whatever happened to the white striped socks? Anyway, before the summer ends, I hope to find the socks of yesterday at a reasonable price. If anyone has any suggestions, please shoot them my way. Thanks!